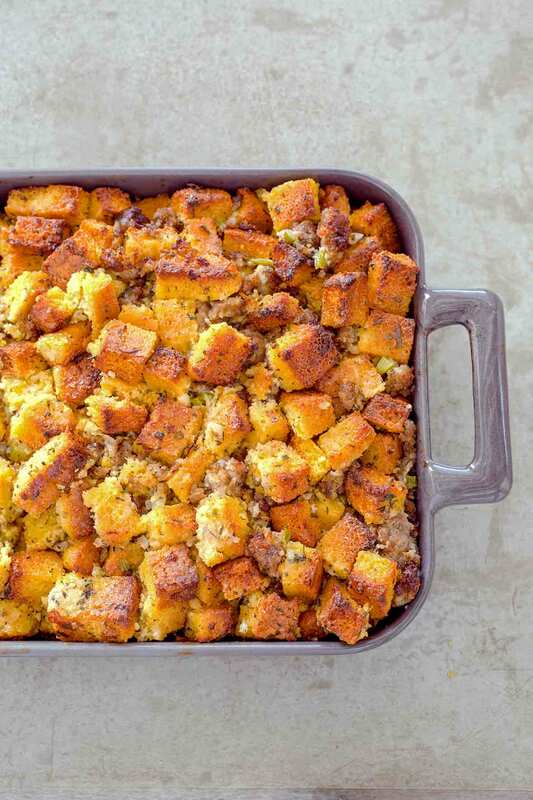 This homemade cornbread sausage dressing is Thanksgiving in a dish. Homemade cornbread is tossed with pork sausage, onions, celery, chicken stock, and herbs. An excellent side dish for any occasion. 1. Adjust the oven rack to the lower middle position and preheat the oven to 375°F (190°C). Butter and flour a 13-by-9-inch (33-by-23-cm) baking dish and tap out any excess flour. 2. In a medium bowl, whisk together the milk, oil, and eggs. 3. In large bowl, combine the cornmeal, flour, baking powder, and salt. Slowly whisk in the milk mixture until smooth. Scrape the batter into the prepared dish and bake on the lower-middle rack until golden and a toothpick inserted in the center comes out clean, 20 to 30 minutes. 5. Preheat the oven to 250°F (120°C). 6. Cut the cornbread into 1-inch (2.5-cm) squares. Divide the cornbread between 2 rimmed baking sheets. If drying the cornbread overnight, leave the cornbread on the baking sheets, uncovered, at room temperature for at least 12 hours. If drying the cornbread in the oven, slide the baking sheets into the oven and bake, stirring occasionally, until dry, 50 to 60 minutes. Let the cornbread cool completely, about 30 minutes. 7. In a 12-inch (30-cm) skillet over medium-high heat, cook the sausage, using a wooden spoon to break it up as it cooks, until no trace of pink remains, 7 to 15 minutes. Using a slotted spoon, transfer the sausage to a paper towel-lined plate. 8. Pour off all but 2 tablespoons fat from the skillet. 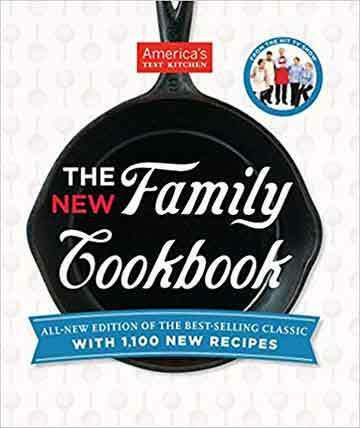 Reduce the heat to medium and add the onion, celery, and 2 tablespoons butter to the fat in the skillet and cook until the vegetables soften, 5 to 6 minutes. Stir in the garlic, sage, and thyme and cook until fragrant, about 30 seconds. Stir in the broth, remove from the heat, and let cool for 5 minutes. 9. In a large bowl, whisk together the half-and-half, eggs, salt, and cayenne, if using. Slowly whisk in the warm broth mixture until incorporated. Gently fold in the cornbread and sausage. Let the mixture sit, stirring occasionally, until the cornbread is completely saturated, about 20 minutes. 10. Adjust the oven rack to the upper-middle position and preheat the oven to 375°F (190°C). Butter a 13-by 9‑inch (33-by-23-cm) baking dish. 11. Spoon the cornbread mixture into the prepared dish. Melt 4 tablespoons butter and drizzle it evenly over the cornbread. Bake on the upper rack until the surface is golden brown and slightly crisp, 30 to 40 minutes. Let cool for 15 minutes before serving. This homemade cornbread sausage dressing is serious. I almost feel bad serving it as a side. After all, it’s got sausage in it, so why not start a new holiday tradition? Serve it as a main with a big green salad on the side. The sage makes it feel like a holiday dish, but since we’re not cornbread stuffing or dressing people, I’d love to have this for a special meal. Maybe even brunch! I may have drizzled leftovers with syrup and topped it with a fried egg for a breakfast treat. The dressing was a bit salty for my taste. The sausage I used was highly seasoned so you may not need additional salt. The downside of this dressing is that it’s a lot of work. Baking and drying the cornbread in advance is definitely something to consider. From start to finish, I worked on this stuffing for nearly 7 (!) hours! Now, it wasn’t all hands-on time, but breaking the recipe into smaller, more manageable steps is definitely a must – especially if you’re serving this for a holiday meal. I don’t see why you can’t bake and dry the cornbread 2 days in advance and brown the sausage the day before. (I didn’t get any drippings from the sausage I used.) Doing the last bit of cooking and assembly the day off wouldn’t be a big deal at all. Many of the cornbread cubes crumbled completely when I tried to stir it all together, but the final product wasn’t a soggy mess. Some cubes did stay together adding nice texture. It stayed warm for a really long time and it tasted fantastic at room temperature. It’s a win! This homemade cornbread sausage dressing made was a fantastic variation on traditional stuffing or dressing. The finished dish was crisp on the outside and soft on the inside, and the combination of sausage with cornbread was outstanding. In my family, the dressing is as much the star of Thanksgiving as the turkey is. I've been eating the same dressing for 60 years and cooking it myself for at least 50. With that in mind, it's a little hard for me to judge another dressing. However, this one seems a more-than-adequate co-star for the turkey. The flavor is good, the recipe is not too difficult, and the ingredients are common and easy to find. Hands-on time was about 25 to 30 minutes, fitting easily into a busy day's cooking. Homemade Cornbread Sausage Dressing Recipe © 2014 America’s Test Kitchen. Photo © 2014 Carl Tremblay. All rights reserved. All recipes and photos used with permission of the publisher.